Send Your Friends Stickers on LINE STORE! Start by heading to LINE STORE (https://store.line.me/home/en) to find the perfect sticker gift! 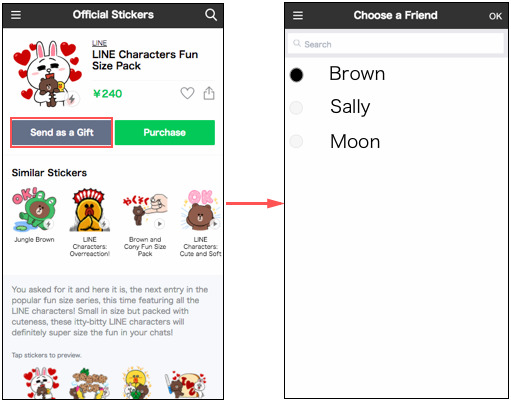 Once you find the right sticker set, just tap "Send as a Gift" to select the friend you want to send it to. Select your friend and then tap OK in the upper-right corner of the screen. Choose a gift image template on the Gift Details screen. Your friend will receive this image as part of your gift message. Then, just tap the Send Gift button to go on to the Select Payment screen. Discover the joy of giving today with this easy gift-giving feature! Check out LINE's official web store where you can buy stickers, themes, and game currencies all in one place. With a wide range of payment options, there's something here for everyone.